Package: 1ml amp (100 mg/ml). 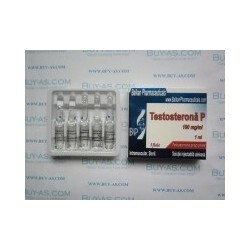 Testosterone Propionate by Balkan Pharmaceuticals, Moldova, is an injectable steroid which contains 100mg per ML of the hormone Testosterone Propionate. The Propionate ester is much faster acting (2-3 days) than Testosterone enanthate or Testosterone cypionate, and thus requires a more frequent injection schedule such as every day or every other day in order to keep blood levels as stable as possible. The benefit to this however, is that the steroid can be cleared from the body much more quickly after use is discontinued, thus making it a more preferable choice for tested athletes. Some bodybuilders also claim that Propionate tends to induce far fewer estrogen related side effects such as bloat than do the other esters of this powerful hormone.